Mediaset S.p.A., also known as Mediaset Group in Italian, is an Italian-based mass media company which is the largest commercial broadcaster in the country. Founded in the 1970s by former Italian prime minister Silvio Berlusconi and still controlled today with a 38.6% stake by his family holding company Fininvest, the group competes primarily against the public broadcaster RAI, the privately owned La7 and Sky plc's Sky Italia. Mediaset's headquarters are in Milan, Lombardy. Many of its studios are located in the Milano 2 area of Segrate, a municipality bordering Milan, where broadcasts of local station TeleMilano (now airing nationally as Mediaset's Canale 5) began in 1978. After merging with various local broadcaster to form the Canale 5 syndication, much production was moved to Cologno Monzese, where the infrastructure of the former Telealtomilanese was present. The company currently has three main television production centres, in Milan (Segrate, Cologno Monzese) and Rome. Mediaset Group's story began in 1978, with Telemilano, a local Milan-based broadcaster that became Canale 5 two years later and began broadcasting nationally. Canale 5 was subsequently joined by Italia 1 (bought from the publishing group Rusconi in 1982) and Retequattro (acquired from Arnoldo Mondadori Editore in 1984). Television area was called RTI and became established with three national analogue networks, supported by an advertising sales company, Publitalia '80, that exclusively collects advertising for all three channels, and two other companies, Videotime, that manages TV technology and production activities, and Elettronica Industriale that guarantees signal distribution through the management of the broadcasting infrastructure. In 1996 RTI, Videotime, Publitalia and Elettronica Industriale were brought together in a single group, Mediaset, which was then listed on the Milan stock exchange, opening up the company to both important institutional investors and private investors (around 300,000). In 1997, Mediaset expands outside Italy with the acquisition of a 25% stake in the Spanish broadcaster, Telecinco. In 1999, Mediaset Group expands its web-based activities with a television portal dedicated to Canale 5, Italia 1 and Retequattro and a daily online news service, is accessible from a range of media (internet, TV, radio, Mediavideo teletext and mobile phones). In 2003, Mediaset increases its stake in Telecinco and becomes the major shareholder with 50.1% of the shares. The following year the Spanish TV company was listed on the Madrid stock exchange. In 2004, with the debut in Italy of digital terrestrial television, an innovative signal broadcasting system that uses standard aerials and a small set-top box. Mediaset launches Media Shopping, a hope shopping channel. In 2005, the group launched Mediaset Premium, a pay digital terrestrial television service which offered live Serie A football, with a pre-paid card and without a subscription. Mediaset Premium also had a pay-per-view offer including films (including first TV-screenings), theatre and live events. In 2006, Mediaset launched Europe's first digital terrestrial Mobile TV network using DVB-H (Digital Video Broadcast Handheld) technology. 2007 was the year of acquisitions and international expansion as Mediaset took on the look and feel of a major network, the only one of its kind in Europe, and in a consortium with Cyrte Fund and Goldman Sachs, acquires from Telefonica a controlling interest in Endemol, the Dutch production company and world format leader; buys Medusa, Italy's leading film production and distribution company; reaches an agreement for the acquisition in acquisition in 2008 of Taodue, a leading Italian producer of high-quality TV drama; enters China, where the 2008 Olympic Games will be held. Mediaset obtained the licence to sell advertising for China Global Media which in October launched the sports channel China Sport Network, a consortium of seven regional broadcasters with an audience reach of 400 million viewers. Publieurope which sells international advertising for the channel; launching a new free digital terrestrial channel, Iris, featuring auteur cinema, music, literature and theatre. In 2008, creation of Premium Gallery, a new digital terrestrial premium content offer available with a pre-paid card. Three new worlds, Joi, Mya, Steel, where viewers can see exclusive previews of the best TV series and films from Time Warner and NBC-Universal. On July, the Gallery family is joined by the Disney Channel and Premium Calcio 24 kicks off. At 2008 end, the Premium Gallery offering further improved with the launch of Premium Fantasy, including four proposals dedicated to children and teenagers. In addition to Disney Channel and Disney Channel +1, the expanded offering includes: Playhouse Disney, Cartoon Network, Hiro. In the same year, Telecinco enters the North American market with the acquisition of a 29.2% stake in Caribevision - a US broadcaster for the country's Spanish-speaking population - while a joint venture was established between Medusa Film and Taodue, leader in the production of quality TV dramas. The union of these two companies will lead to the creation of an Italian production unit which will compete with the main international majors. In 2009, Mediaset sees the launch of new website. Mediaset Premium will double its offer of cinema with the launch of Premium Cinema and the much anticipated re-launch of Studio Universal. On 20 November Mediaset Premium will launch a new feature: Premium-On-Demand, a digital library with 50 films, updated daily, and American TV series. Also 20 November Premium will also launch two features dedicated to the cinema: Premium Cinema Emotion and Premium Cinema Energy. Publitalia'80 and Mondadori Pubblicità, stipulated an agreement for the realisation of a joint initiative aiming at gathering advertising on line. On the basis of this agreement, a new company was founded on 30 July owned jointly by Mediamond. On 31 July Mediaset sees the launch of TivùSat, Italy's first free digital satellite platform, built by a company jointly owned by Rai (48.25%), Mediaset (48.25%) and Telecom Italia Media (3.5%). TivùSat is a complementary platfor to the existing digital terrestrial platform, and is able to reach areas of the country not covered by the terrestrial networks. On 18 December 2009 Mediaset S.p.A., the subsidiary Telecinco and Gruppo Prisa approved and signed an agreement that foresees, conditional upon determined conditions being met, the acquisition by Telecinco of a newly founded company which will include the company part of Cuatro and its shareholding of 22% in Digital Plus. In 2010, the title News Mediaset is operational: an internal press agency that will provide images, news and services for all of Mediaset's news structures. Two free-to-air channels were launched: La5, dedicated to a mainly female audience; Mediaset Extra, dedicated to Mediaset channels' entertainment programmes from yesterday and today. Mediaset Premium see the launch of Premium Cinema HD: previews of films in HD. From October, Premium will broadcast, using the on demand system films in 3D. To watch the films viewers will need a 3D TV and a normal Premium On Demand HD decoder which, as well as providing a high definition signal, is also equipped to carry 3D. The Commision Nacional de la Competencia (the Spanish antitrust commission), with a resolution dated 28 October 2010, authorised the acquisition by Gestevision Telecinco S.A. of exclusive control of Sociedad General De Television Cuatro S.A.U. through the purchase of 100% of its share capital, subordinate to certain conditions. Telecinco, having met the suspension conditions to which it was subjected, today acquired a 22% stake in "DTS Distribuidora de Televisión Digital SA" ("Digital+") and 100% of the share capital of "Four Television SAU" ("Sogecuatro"), holder, among other things, of the free-to-air channel "Cuatro". This operation resulted in the Mediaset Group becoming Spain?s biggest television operator. Mediaset launched a new service called Premium Net TV, a new non-linear "over-the-top" TV system that offers films, TV series, cartoons, documentaries, football; in addition to all of the Mediaset channels' programmes of the last seven days and the entire offer can be seen also on a PC with the same quality as on TV. Premium Net TV is a completely open, independent network system, viewable with any Gold Stamp digital decoder and a broadband connection from any telephone carrier and it is included in the standard Mediaset Premium subscription, without any additional cost. Mediaset launched four new channels on its digital terrestrial platform: BBC Knowledge and Discovery World that broadcast documentaries; while Premium Crime dedicated to enthusiasts of thrillers and detective stories and Premium Cinema Comedy to those who love both Italian and American light comedy. Mediaset launched new three free-to-air channels: Me, in which Mediaset will reinforce its presence in the mail order sales sector with a new brand and a new approach; TgCom24, a new, live, free-to-air, all news channel, also available online in live streaming on the TgCom24 website, and on smartphones and tablets. In November, Italian viewers can access Premium Play, a new TV service. A consortium headed by Mediaset, and also consisting of Goldman Sachs and John de Mol's Cyrte Group, acquired Dutch television production company Endemol in 2007. On March 23, 2012, Endemol's debt was converted into shares by US private-equity firm Apollo Global Management. On April 3, 2012, Mediaset sold its majority stake in Endemol to Apollo and Dutch asset manager Cyrte. 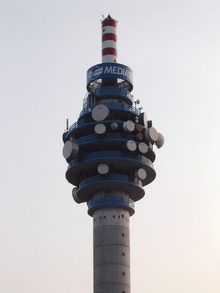 In January 2008, the European Court of Justice ruled that the TV frequencies used by Mediaset to broadcast Rete 4 were shared out unfairly. They should have been given to Europa 7, a competitor channel, the judges maintain, and Rete 4 should be broadcast via satellite instead. Although the Italian Council of State, the highest court on administrative matters, has confirmed that the Italian government should abide by this European ruling, Rete 4 continues its operation on analog frequencies and on DVB-T.
On 30 July 2008, Mediaset filed a lawsuit against Google for €500 million (US$779 million) charging copyright infringement. The company stated that 325 hours worth of material was uploaded to YouTube and the result was the loss of 315,672 viewing days and ad revenue. On September 16, 2009, SKY Italia (fully owned by News Corporation) filed a lawsuit to the Court of Milan, Italy, against Reti Televisive Italiane and Publitalia '80 for a violation of Article 82 of European Treaty that regulates free economic competition between companies, in particular for refusing to allow SKY Italia to purchase advertising on the three main Mediaset television channels (Canale 5, Italia 1 and Rete 4), exercising Article 700 of the Italian Civil Procedural Code who permit to require an urgent action. Mediaset has rejected the charge of antitrust violations, stating that in 2009 it had broadcast SKY Italia commercials 3107 times on its channels, whereas SKY Italia has always refused to broadcast Mediaset commercials. ↑ "Azionisti rilevanti di MEDIASET SPA". CONSOB. 27 October 2016. Retrieved 31 October 2016. ↑ "Offices". Mediaset. Retrieved 31 December 2009. ↑ "Endemol to apply for de-listing after consortium takes 99.54 pct of shares". AFX News. Forbes. August 6, 2007. Retrieved August 11, 2009. ↑ Fonte, Giuseppe (May 31, 2008). "Italy court rejects Mediaset appeal to EU ruling". Reuters. ↑ Lawson, Stephen (July 30, 2008). "Mediaset Files EUR500 Million Suit Vs Google's YouTube". IDG. The New York Times. Retrieved May 12, 2010. ↑ "Italian Media Company Sues YouTube". Dow Jones Newswires. CNNMoney.com. July 30, 2008. Retrieved September 13, 2008. ↑ "News Corporation's Sky Italia Files Lawsuit Against Mediaset Companies For Antitrust Violations". News Corporation press release. September 16, 2009. Retrieved September 16, 2009. ↑ "Sky porta Mediaset in tribunale" (in Italian). Il Sole 24 Ore. September 17, 2009. Retrieved September 17, 2009. ↑ "Mediaset respinge accuse infondate del concorrente SKY". Mediaset Group press release. September 16, 2009. Retrieved September 16, 2009. ^Note 1 Joint venture with RAI (48%) and Telecom Italia Media (4%). ^Note 2 Joint venture with Class Editori (60%) and NBCUniversal (20%).